Located in the center of Friedrichshagen, the old building with its unostentatious façade in a warm rosé blends into its surroundings perfectly. Bölschestraße 30 towers over the lower buildings on either side, mirroring Bölschestraße’s overall architecture. The balconies on the facade make the building, which was constructed in 1902/03, stand out. Typical Art Nouveau elements can be found in the interior of the house, on the beautifully decorated front doors as well as on the large, subdivided windows that flood the apartments with plenty of light. 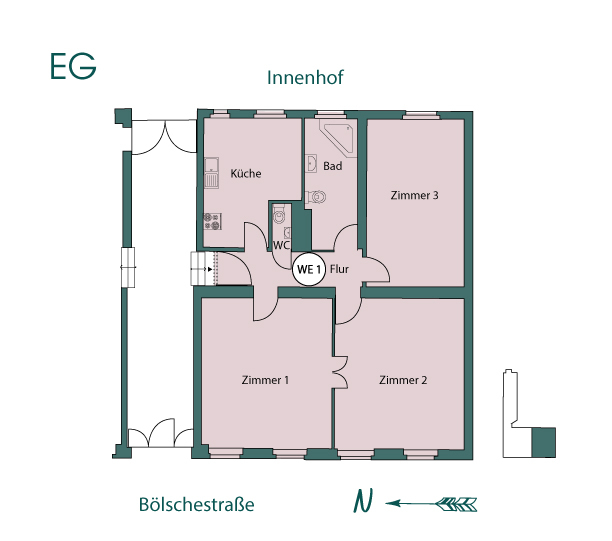 The main building houses a total of 13 units and is part of Bölschestraße’s listed ensemble, the garden house contains 2 units. 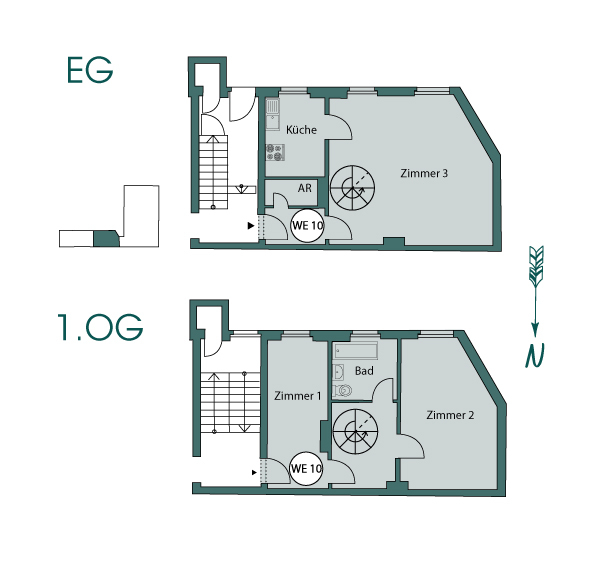 Apartment sizes range between 1 and 5 rooms. 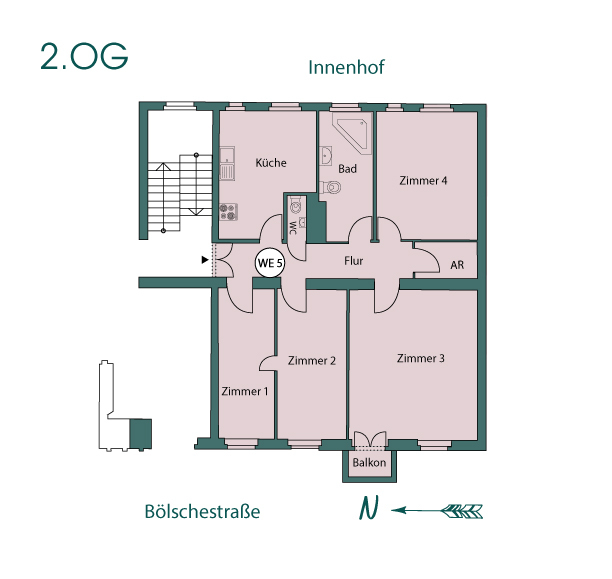 From the front building, which is located directly on Bölschestraße, a side wing braches off, away from the street and along the courtyard. The pristine inner courtyard offers green areas for relaxing, a shed for bicycles, and a playground for children. Another highlight of the property is the garden house, which the courtyard separates from the rest of the building, creating a private atmosphere. 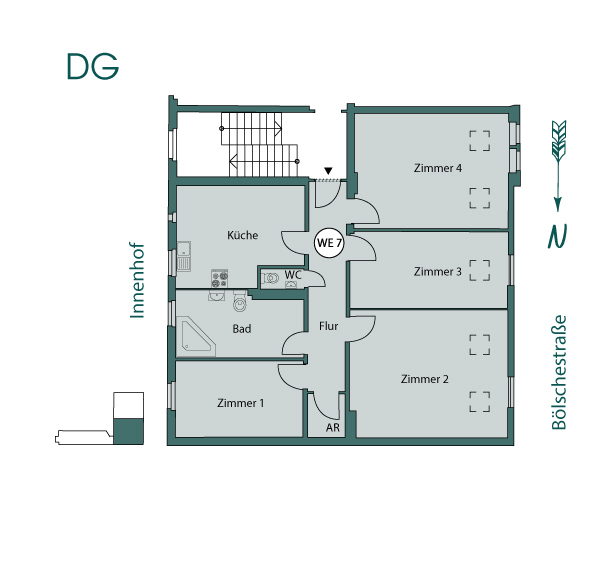 In Bölschestraße 30 families, couples and singles will find a place to call home. Apartments in the front building and side wing will suit fans of old buildings. The garden house offers a more modern design. Vintage flair, the quality of life of an organically grown community, and just a short walk to the lush greens by the Müggelsee: Friedrichshagen has preserved the charm of an idyllic world that has attracted Berlin’s artists and those seeking peace and quiet for centuries. 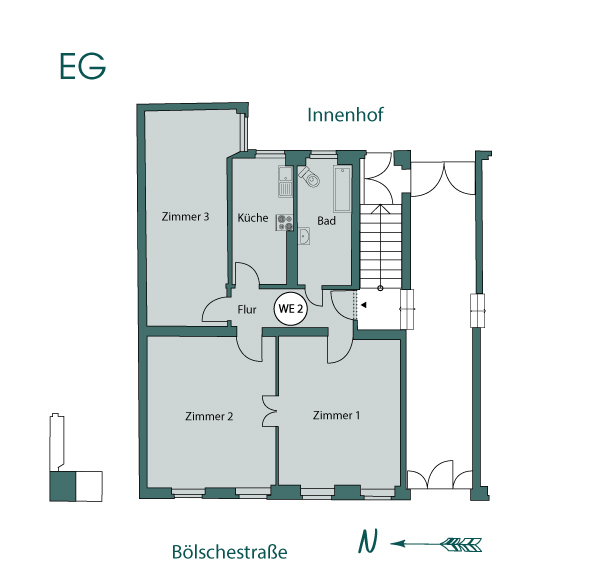 The district belongs to the beautifully situated Köpenick, which has largely retained its authentic rural character. 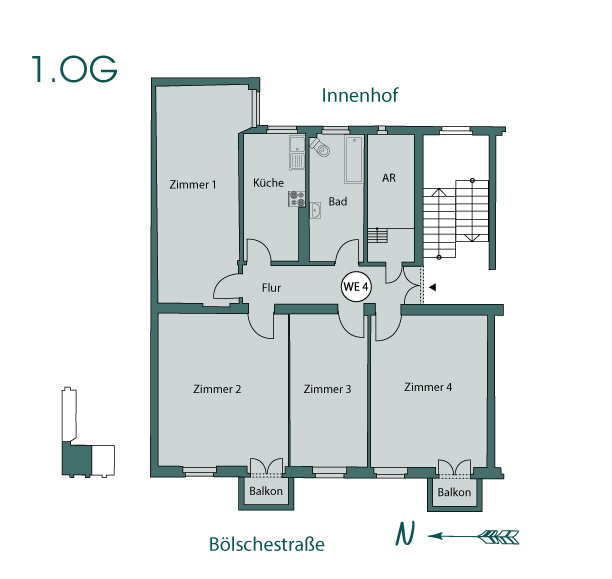 The house is not located directly on Friedrichshagen’s busy main street but in one of the smaller side streets. Bölschestraße itself is home to several large and small boutiques and various supermarkets that cover all your daily needs. There is a nice blend of restaurants, lots of cafés and galleries. Müggelsee and its Friedrichshagen beach is just a 10 minute walk away. The Müggelsee’s shore is only partially developed and offers plenty of natural space to relax and stroll around. Children can grow up surrounded by nature. 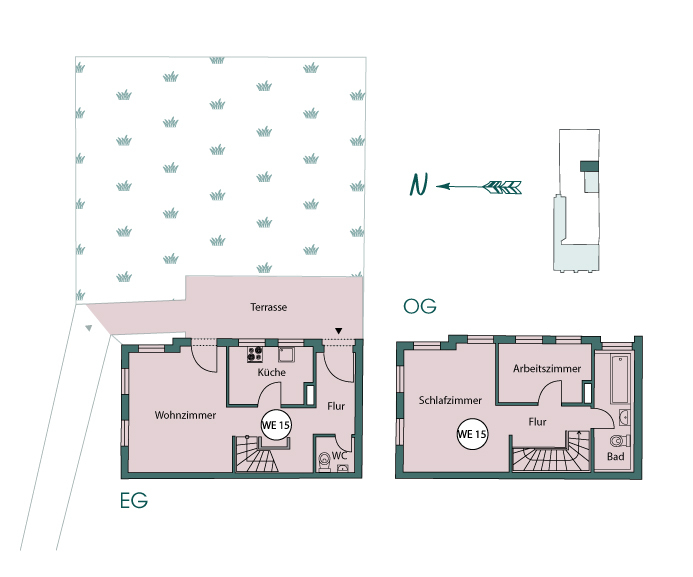 There is an elementary school and a grammar school just a short walk away from Bölschestraße 30. 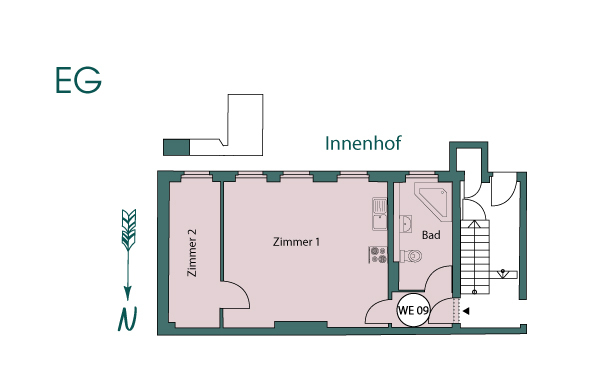 While family life in Friedrichshagen is rather secluded, the center of Berlin is just a few minutes away. Tram and bus stops are very close to the entrance of the building. You can get to Berlin central station from the Friedrichshagen S-Bahn station in about half an hour. Would you like to find out more or make an appointment? Please contact us, we love to meet you! You are very busy? Always on the move? Arrange a phone call at you preferred time with us.